Saw this post on another blog and I had to play. I am a sucker for these things! Copy this list, post on your blog and bold the items that you have done. This year for Christmas I got the most exciting gift! Well, I actually got quite a few, I had a very nice Christmas. But, there is one in particular that will allow me to be very creative. It is Carol Fenster’s 1,000 Gluten-Free Recipes cookbook! WOOHOOO!! This cookbook is absolutely amazing! Not only are there tons of baked goods (we all know I have a sweet tooth), but the meals look wonderful! My Mom, who doesn’t have to eat GF, is going to buy this so because she wanted to try out so many of the recipes. Plus, she will have ideas for Jon and I as well. Thanks so much, Kelly, Greg & Noah! These cookies have to rank right up there with my favorite cookies from my childhood. I love that you can add any kind of jelly topping that you like to them. I was afraid that when I had to go gluten-free that I would miss out on my favorites like these, but, I was wrong. My wonderful Mother has made these every year for me, even gluten-free. She uses Gluten-Free Pantry’s Beth’s Gluten-Free All Purpose Flour as the flour in the recipe. Heat oven to 350. Mix thoroughly butter, shortening, sugar, egg yolks, and vanilla. Work in flour, xanthan gum, and salt until dough holds together. Shape dough by teaspoonfuls into 1 inch balls. Beat egg whites slightly. Dip each ball into egg white, then roll in chopped nuts. Place 1 inch apart on ungreased baking sheet. Press thumb deeply into center of each. 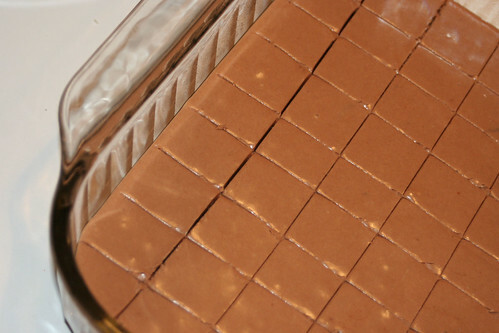 Bake about 10 minutes or until light brown. Immediately remove from baking sheet; cool. 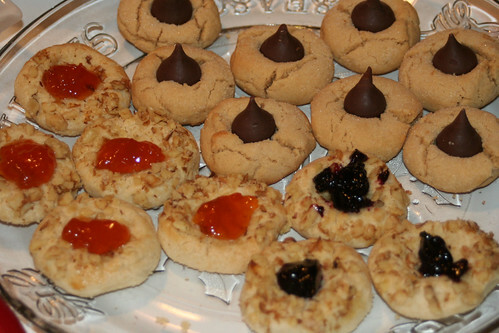 Fill thumbprints with jelly / jam before serving. Now, in the picture above I have my new favorite cookies, Peanut Butter Blossoms. They are awesome too! 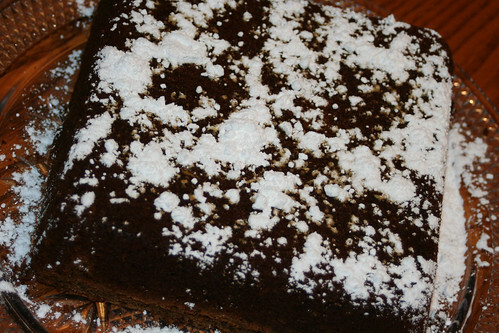 Another favorite dessert I enjoyed as a child was Gingerbread or Gingerbread Cake. I haven’t had this in years, so I decided that it was high time to make it gluten-free. I took a recipe from allrecipes.com and converted it to be gluten-free. It was a fairly simple recipe and not very time consuming at all. Not only did I sub GF flour, but I cut the butter in half and added in 1/4 cup applesauce, I also doubled the spices. I am only typing out the recipe as I made the cake below. 1. Preheat oven to 350. Pam or grease & flour a 9-inch square pan. 2. In a large bowl, cream together the sugar and butter. Add in the applesauce. Beat in the egg and mix in the molasses. 3. In a bowl, sift together the flour, baking soda, salt, spices, xanthan gum. Blend into the creamed mixture. Stir in the hot water. Pour into the prepared pan. 4. Bake 1 hour in the preheated oven. Check after 45 minutes or so, as I didn’t have to cook mine longer than 50 minutes. Allow to cool in pan before serving. 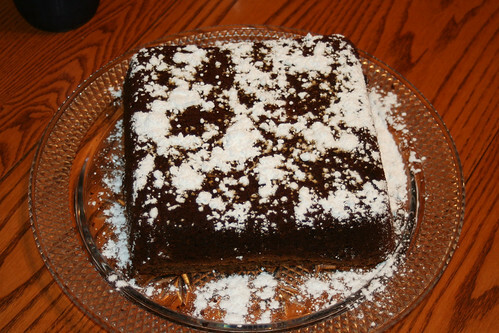 I flipped my cake onto a plate after it cooled and topped with powdered sugar. I served it with Cool Whip. What a whirlwind the last week has been! Phew! I am glad it is over. I will be even happier when we are back to our normal routine and some of this craziness is gone. Yes, it was wonderful to see our family and spend time with them, but everything seems so chaotic. It will be nice to return to the somewhat predictable schedules that we keep. During the last week we had so many fabulous meals & treats. It all seemed so smooth, too. The meals were all prepared gluten-free or mostly gluten-free to avoid cross contamination. Neither Jon or I got sick, so that is a plus. 😉 We also enjoyed lunch out one day at Red Robin. We had a hard time with the service, mostly just being slow and not following through, but Jon and I felt great after eating there. It was really busy, so that may have been part of the issue. So, this week is still not back to normal, but we don’t have any real big plans. I doubt that I will even make it until midnight on New Year’s Eve. 😉 I am getting old, you know. I will probably have to make bread, though. Oooh….I almost forgot. My sister got me the most amazing cookbook for Christmas. 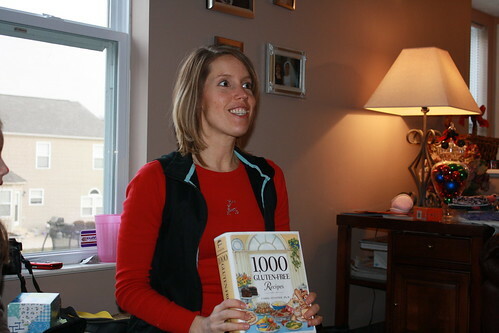 She got me Carol Fenster’s new cookbook, 1000 Gluten-Free Recipes. WOW!! This cookbook is amazing! Not only are there tons of baked goods, but the meals…..I am in heaven! Another wonderful cooking gift….hubby got me a huge griddle for cooking pancakes, bacon & such. This thing is so big that I can cook a pound of bacon on it at one time! OMG! It is amazing! So much easier than standing over a pan going through rounds of 6 or 7 strips at a time. Don’t foget to pop over to Cooking & UNcooking, M-Elle is hosting this week’s GF menu swap. And, as always, Orgjunkie has tons of menu plans up. 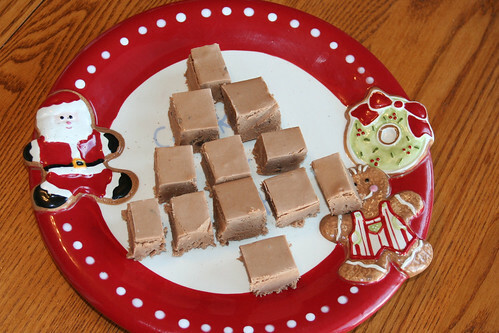 This recipe has got to be my all-time Holiday favorite. I remember eating piece after piece of this when I was a kid. My Grandmother (Dad’s Mom) made this (and a lot of it) each Holiday season. I finally asked for the recipe last winter and started to make it myself. I was a little intimidated by the fact that I needed to use a candy thermometer. I didn’t have one, so I used an instant read meat thermometer. That didn’t work so well. The pan of hot bubbly goodness was too hot to hold the thermometer over to see it reach the desired 236 degrees or “soft-ball stage”. As you can probably tell, a candy maker I am not. LOL! This year I used a different thermometer, still a meat thermometer, but it is one of those that you can place in and run the wire outside of the oven and it fit nicely in the pan, without my holding it there, and then I set the temperature alarm to go off when it hit 236. Much easier. 1 12 oz bag milk chocolate morsels. Beat until well blended. Pour into 13 x 9.5 inch glass baking dish. Score while warm, cut when firm. I freeze some of this and then keep the remainder in the fridge b/c I like it best cold. Pair this with the Peanut Butter Fudge that I made last week and what more do you need?